The original compact mount for larger phones. Airframe+ opens wider than original Airframe to hold phones like the iPhone Xs Max and 8 Plus, but keeps the same compact size and still weighs only 1 ounce. Lifetime Warranty. Make sure to check out our newest mount, Airframe Pro! It holds even larger phones and cases. All your hands-free apps, right where you need them. Emi takes us on a ride with Airframe and Airframe+. Traveling? Bring Airframe+ and add navigation plus your own music to any rental car. Over 3 million Airframes sold. Airframe and Airframe+ have been a favorite of commuters, road-trippers, and professionals around the world since 2013. Holds the iPhone SE up to the iPhone 8 Plus. Works great for the Samsung S9 and S9+, too. Holds tight at any angle. The vent clip fits standard and thick vent louvres and spins 360° for portrait and landscape mode and angled vents. Works great outside the car, too. Just insert a card for an easy kickstand and watch movies anywhere. Does Airframe+ work with my phone? Airframe+ works with all iPhones with standard size cases, and all other smartphones with up to a 5.8" inch display in 16:9 aspect ratio or 6.1" in 18.5:9 aspect ratio. Airframe+ will not work with some waterproof-shockproof cases for the iPhone Plus series or tablets. Will Airframe+ damage my car's air vent? No, the vent clip uses a soft, grippy elastomer to keep your car free from scratches. Is Airframe+ really the worlds smallest, most portable smartphone carmount? Airframe and Airframe+ are the original compact vent mounts! Accept no imitations! They both weigh about an ounce and are small enough to fit in your shirt or pants pocket. What is the difference between Airframe+ and Airframe? Airframe+ is designed for wider phones, phablets and cases than Airframe. Airframe+ works with phones or cases up to 3.4 inches wide, while Airframe works with phones and cases up to 3 inches wide. Will Airframe+ work in my car? 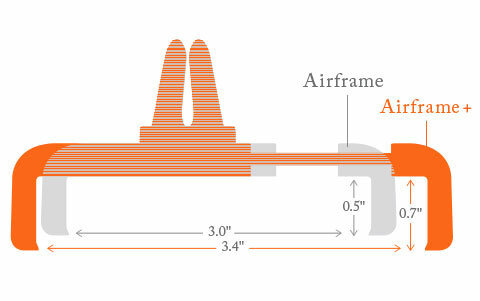 Airframe’s patented rotating clip works best with horizontal, vertical, or angled car air vents with straight, flat slats. For circular vents like those in the Mercedes CLA or most MINI's, use Airframe Pro. Is Airframe+ available for distribution? Yes. Please email us at sales@kenu.com. Does Airframe+ work in Landscape mode? Yes, assuming the make and model of your car’s air vent has enough space to display your phone horizontally. Are import duties included in international shipping prices? Our shipping prices do not include import duties or taxes (VAT, GST, customs, etc.). It is your responsibility to pay them at time of delivery.